Citric acid formula is virucidal, fungicidal and bactericidal, and kills 99.9% of bacteria on hard, nonporous surfaces when used as directed. Professional LYSOL Disinfectant Bathroom Cleaner, 32oz Spray Bottle, Fresh Scent - Professional Lysol II Disinfectant Basin Tub and Tile Cleaner cleans, shines, disinfects, deodorizes and controls growth of mold and mildew. Use on glazed ceramic tile, fiberglass, glazed porcelain, synthetic marble, stainless steel (non-medical) fixtures, chrome (non-medical) fixtures, vinyl and laminated plastic. This citric acid formula is virucidal, fungistatic and bactericidal and kills 99.9 percent of bacteria on hard, nonporous surfaces. It kills HIV-1 (AIDS virus), staph and strep germs on fiberglass, porcelain, stainless steel, plastic, vinyl and more. It contains no abrasives or bleach and has the ability to remove soap scum, lime scale and hard water stains on restroom fixtures. 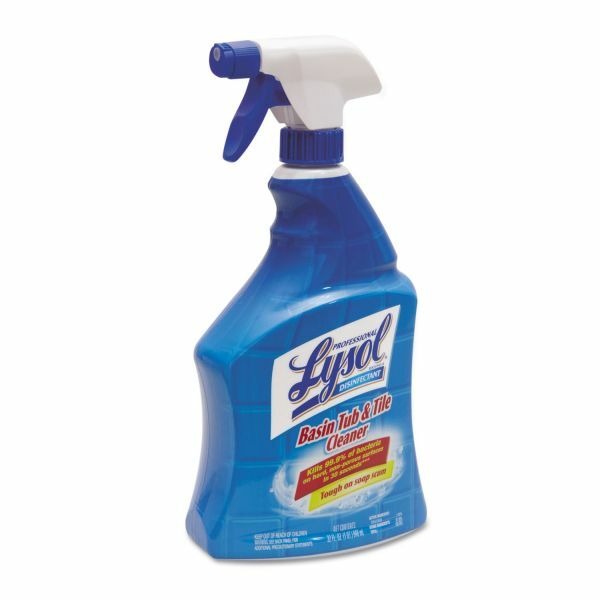 Ready-to-use cleaner comes in an easy-to-use, trigger-spray bottle.